Q1: how many variables will Rugloop capture ? At what sampling frequency ? A1: Rugloop will always capture ALL processed variables from the connected monitors to write them to file, for offline processing. The Rugloop screen, of course, cannot display all variables, and will provide you with a selection of them. The sampling frequency is monitor-dependent and ranges between 1 to 10 s, the average being 5 s.
Q2: does Rugloop support realtime data capture? A2: Yes, as an option wave capturing is available in Rugloop. For more information click here . Q3: what PC is required to run Rugloop? A3: You need a PC capable of running Win2K, WinXP or VISTA, with as many serial ports as you want to connect devices. For Rugloop monitor-only, a PentiumII-class PC or better is sufficient. Count at least 10MB of free HD space, plus 2MB per hour of patient data you want to record. Q4: I cannot get connection to my monitor. How can I find out what COM port I need to select for a specific monitor? A4: Unfortunately, no uniform answer exists. Since this is dependent on your specific PC environment, a procedure is required for proper setup. Luckily, Rugloop remembers your settings, so you have to do this only once. - WHEN USING EXTERNAL SERIAL PORT DEVICES (like Demed 2-Port), YOU SHOULD TAKE CARE TO ALWAYS USE THE SAME USB CONNECTION ON YOUR PC. When changing the USB port, Windows will re-enumerate all the serial ports, requiring full reconfiguration of Rugloop. - at first, you need to know what COM ports are avialable on your PC. A useful tool to do so can be found here. 1.For all devices except one, set the COM port selection to 'Off' in Rugloop. 2 At the single device still trying to connect, sequentially select a COM port which you know is available on your system, and wait a few seconds (max. 30 is needed) to allow connection. 3 When a connection is found, Rugloop will disable the COM port selection box, and start device communications. 4 Restart Rugloop to find the other connections. Repeat steps 1 to 4 until all ports are operating. In step 1, do NOT disable the ports that have been successfully connected in previous loops. REMARK: From Rugloop11.27 on, Rugloop will only show for selection the serial ports which are physically present on your system ! Please upgrade your older Rugloop versions to benefit from this feature. With rugloop11.27, the procedure as described above remains the same, except that Rugloop only allows to select ports which exist on your system. we advise to physically mark your cables in your hardware setup to avoid frequent reconfiguration ! The red lines indicate the algorithm used by the BIS monitor to calculate the BIS value. This algorithm is dependent on BIS monitor revision AND on the type of sensors used. It was reported by Rugloop users that the names on the 3 columns might switch, even when using the same setup AND the same sensor type. Follow-up shows that this is caused by Rugloop being started while the SENSOR is not yet connected to the active A2000 monitor, causing the monitor to send its default labels to Rugloop. Afterwards, when the sensor is connected, the monitor changes to the correct algorithm but this goes unnoticed for Rugloop. IT IS IMPORTANT TO KNOW THAT THE DATA IN THE FIRST COLUMN IS THE ONLY CORRECT DATA IN EITHER CASE! A new release for Rugloop (11.06) was made that holds initialisation until the sensor is connected to the monitor. In the mean time, a workaround is to make sure to connect a BIS sensor to the monitor before switching it on. Apart from this, please notice that using different sensors on the A2000 may invoke different algorithms on the monitor as well ! It is ESSENTIAL that you use the same type of sensors for all cases of a trial, to ensure you have consistent study results ! A6: RugloopII(c) and Labgrab files are 'pipe'-separated ASCII text files that can be read using any spreadsheet program. Just open Excel, and find the file you want to open. Excel will recognise that the file is a text file, and will present you with a 'text import wizard'. The complete procedure is described in detail in the Labgrab manual, which can be downloaded here. Opening the data in Excel is described in the chapter "Loading RugloopII© and Labgrab© data in a spreadsheet – Microsoft Excel © "
Q7: Why do the Rugloop files' numbers look strange ? Scientific notation is expressed as mantissa"E"exp, and is calculated as mantissa*pow(10,exp). Excel can readily convert between these numbers: after opening a file in Excel, select the whole worksheet, right-click the mouse, and select 'Format cells'. 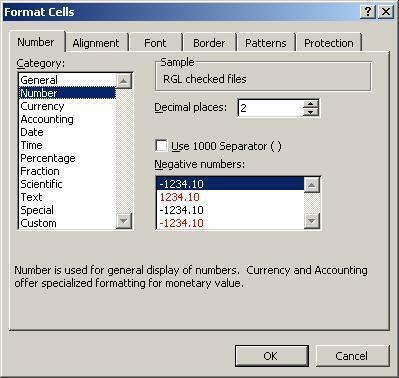 In the Format cells dialog, set the cells to 'Number' format. A8: Most probably, Rugloop is receiving its own frames back. The internal modem of many notebooks will mirror sent frames. Since these frames are properly shaped, the Rugloop algorithm assumes a device is connected and is answering properly (but without data). The internal modem usually is behind COM3 or COM4. Rugloop will lock into this COM port at startup since it receives valid frames. 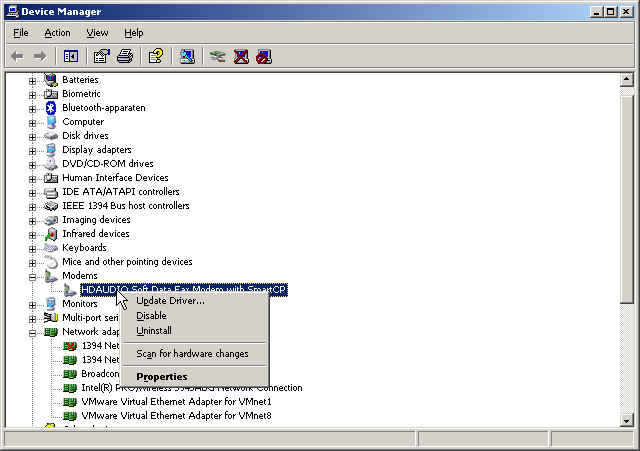 click the selected modem with the right mouse button, and select 'disable' in the context menu. A9: for some reason some audio encoders interfere with the video encoding. This effect is most apparent but not exclusively related to less powerful PC's. The best approach to avoid this effect (at the expense of larger data files) is to only apply video encoding while using raw audio capture. A10: Two possible reasons may exist. The first is that the optical isolation in the pump does not work properly with a low battery when the pump is not externally powered. You should make sure to either use mains power or a fully charged battery for operation. The second reason is when using an Asena PK for a standard Rugloop-controlled TCI application: the Asena PK is not suited for remote control. Please use an Asena CC,GH, or TIVA for this purpose. * specifically, when used in combination with the Danmeter A-line monitor: here, an incompatibility is observed between the 2 devices. It shows as a regular 'framing error' warning in Rugloop. To eliminate the first as possible cause, please run a 'dry' case without a patient connected, out of the environment. If no errors occur, Please contact Demed for further information & support. For the second possible cause, please use a different serial port device, or contact Demed. Q1: do I need Labgrab to process Rugloop-generated data ? A1: No, Rugloop output data is generated in ASCII text formats, and can be readily opened in Excel. BUT .... since Rugloop output data contains a lot of variables in a specific structure, Labgrab greatly simplifies processing Rugloop data for your presentations. Also, the Labgrab sampling wizard enables you to subsample Rugloop data over multiple cases automatically, a task which would take you hours otherwise. - Cp, Ce: Cp, Ce are calculated in columns F, G.
- if they remain "DIV/0", most probably did you enter time zero again at the first line to be filled in. The spreadsheet expects the first line filled in being different from zero, at least for the time ! - the first column ('time25ms") is dedicated to Rugloop users: if your clock counted seconds, you would ignore the first column, and directly enter the time in the second column. If you use the first coulmn, this would be for high-resolution calculations, doing 40units per second.